← For where your treasure is, there also will your heart be (NAB Lk 12:34). The Transfiguration of our Lord Jesus Christ is one of the scenes in the Bible that I keep going back every time I am praising in tongues. What a wonderful scene, and I imagine myself with Peter, James and John, witnessing as the Lord is transfigured but not cowering in fear but in awe of His majesty. The transfiguration came at a time before the Lord entered Jerusalem — to His painful suffering and death. It was meant to prepare the three apostles, that as they have glimpsed the glory and majesty of the Lord, they will remain steadfast in their faith when the Lord will suffer the pain of death. It was also a strengthening for the Lord, who even as God is also a man with his fears of suffering the kind of death meant for him (remember His prayers at Gethsemane: “My Father, if it is possible, let this cup pass from Me; yet not as I will, but as You will.” (Mt 26:39). The affirmation of the Father to a Son who is about to enter the biggest crisis of His life, will have been a source of strength for our Lord Jesus. As I reflect on this, I thought of my fatherhood to my children. I was a believer of “reverse psychology” and I was also a critic, almost to a point of being a perfectionist (I still am, a bit, but only in what I do), not realizing what negative remarks can do to a child’s psychology. It was only when I attended the ABBA Father’s Weekend conducted by the CFC Servants of the Lord that I fully realized the magnitude of my failure as a father – the “verbal abuse” of a negative and irresponsible remark, the psychological beatings that they have borne because they have not reached the standards I’ve set and many more. While I thought that by criticizing my children for their failures, it will make them stronger; and it will teach them their lessons — the opposite was actually happening. Even worse, they turned inwards, kept their pains and hurts deep in their psyche. As we continue to build the church of God in our homes, let us be a fountain of strength for our children; a forefront leader who leads by example and not merely a commander who orders from the back; a servant not like our public servants who clamor to be served but a true servant like our Lord Jesus. 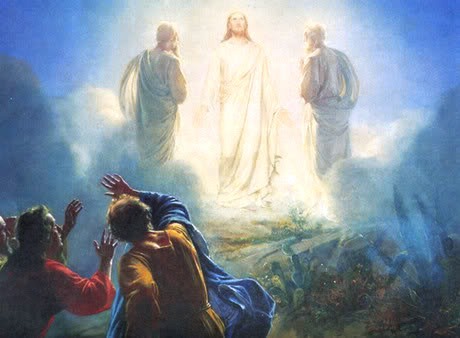 May the Transfiguration of the Lord Jesus culminates in our own transfiguration as we share with Him God’s glory. May you be blessed! This entry was posted in Reflections and tagged affirmation, change, Fatherhood, Transfiguration, Work in progress. Bookmark the permalink.